Getting The Same old, Same old Slop Warmed Over! Relative to the OJ Simpson Case. – maddoggbuttkickingbrown's real truth! 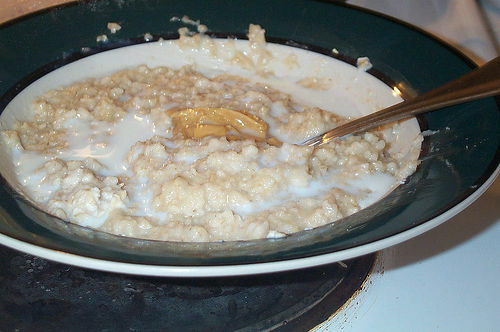 Getting The Same old, Same old Slop Warmed Over! 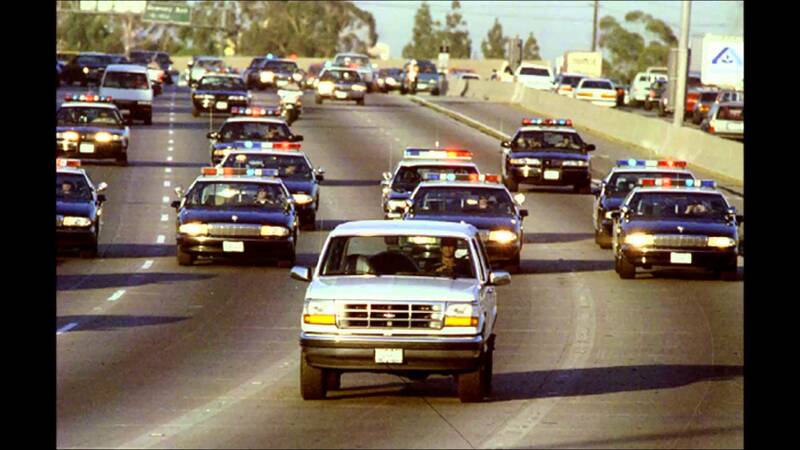 Relative to the OJ Simpson Case. The title above suggests that the public is being served the same old gruel or same slop warmed over relative to the Simpson case. This year, in particular, there are so many documentaries, docudramas, and hidden tapes to reaffirm the same old, same old, OJ Simpson is a murderer allegation that we proclaim is a false narrative. In this 20th anniversary of the murders that took place it makes you wonder, is their a hidden agenda in promoting this narrative beyond the obvious of pecuniary gain? 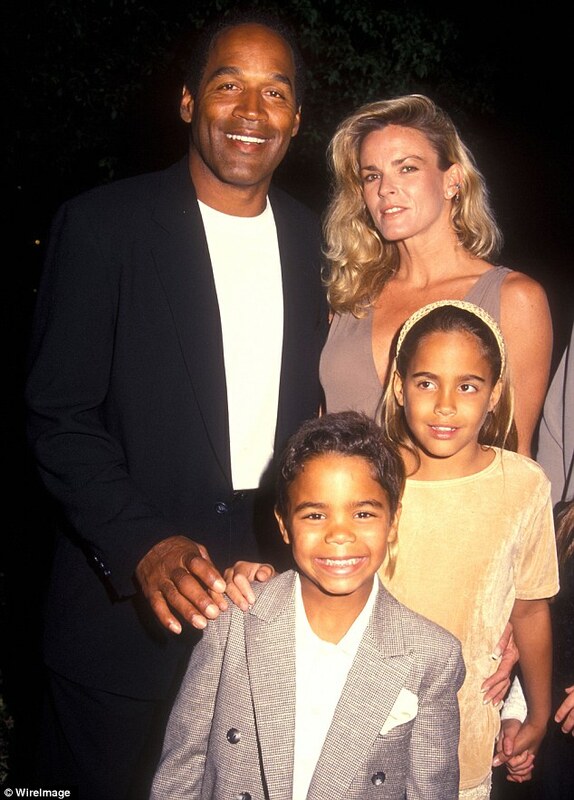 Some of us even wonder, will the day ever come when a producer is unafraid to move beyond the lure of (money) to have the guts to tell the whole truth about the lives and backgrounds of the people associated with this case, or will the children of Nicole and O.J. have enough fortitude to get beyond their own fear to demand the truth, and challenge these willful lies told by sworn court officers to the extent of undermining the total credibility of the U.S. Justice System. It is time to get beyond intentional false allegations masquerading as truth and make those hiding their hand stop concealing what they know truthfully casts considerable doubt or eliminates Simpson as the murderer altogether. There are enough sordid details to go around, but rather than linger on inter-familial irregularities which one can read in a few good book titles, such as Double Crossed for Blood, Pursuit of Exhibit 35 in the OJ Simpson Murder Trial (literally a compendium of knowledge), and The People vs. OJ Simpson. I want to focus on the laxity of the press to let down its guard and give a go-pass to lying law enforcement officers. 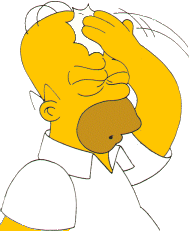 The perennial problem that continues to revolve is that we can’t get beyond examining only evidence geared to finger Simpson, even though other investigators have found evidence intentionally suppressed that points away from him. Some of these broadcast networks appear to know it, because they have received requests at various times over the years for appearances by independent investigators, but to no avail. They media networks would also rather pretend to stick their heads in the sand and not ask presumably dangerous questions. However, if you are going to safe guard a democratic republic what choice do you have but to challenge the status quo, and by all means not accept on face value what you are told. Thus, if a clean cut police detective tells you that Simpson is guilty based upon what the detective has in his left hand, are you psychologically obligated to accept his one hand evidence as fact? What is held in one hand while the other is held behind the back should never be satisfactory to conclude someone’s guilt. News journalists for sure should know this and not allow it to rule over their intelligence and principle of fairness. Now let’s look at this objectively, rather than in a comfort blanket of subjectivity. Even though we may see the picture in the one hand, does it truly show Simpson in a pair of Bruno Magli shoes nine months before the murders? The validity of those photographs were thoroughly challenged during the civil trial by a self trained professional photo expert, Robert Groden. His pedigree was that he was the only one out of many academically trained experts to receive a perfect score to be on the Warren Commission as a photo expert to examine evidence related to the John F. Kennedy assassination. However, we have our own questions regarding these shoes that need to be answered. We believe that true credibility lies in the additional questions that should be asked of the FBI agent, William Bodziak, who brought the allegations of a Bruno Magli size 12 shoe to our attention. 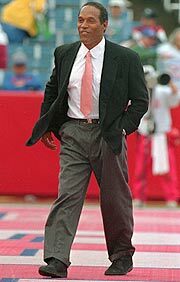 The first question is why wouldn’t Bodziak, the FBI special agent conducting the investigation, have asked for potential photos of Simpson wearing these alleged Bruno Magli shoes when he was making his case on live television during or prior to the trial in the summer of 1995? That was a year after going to Italy and making his discoveries via the Japanese National Police Department in 1994. He never showed the public one picture of Simpson wearing the infamous shoe brand, yet he vociferously alleged to know that the shoes involved in committing those murders at Nicole Simpson’s Bundy address were made by Bruno Magli due to their unique sole pattern left in blood. 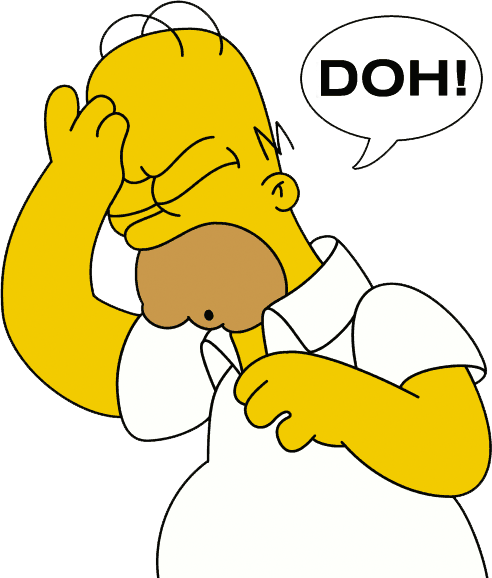 The Simpson criminal trial occurred two years prior to these photos showing up in time for the civil trial. It appears a bit convenient now, two years after Bodziak’s appearance in criminal court in 1995 to show up in 1997. The public would subsequently learn during the civil trial that the shoe photo negatives for these alleged veritable photos of Simpson wearing the Bruno Magli shoes had since Bodziak’s discovery traveled half way around the world to a European country known for photo manipulation before arriving back in the U.S.
Now the question becomes could these photos of Simpson wearing these alleged Bruno Magli shoes have shown up with nefarious help to give Bodziak a safe door out of a dilemma of his own choosing, and allow the FBI to save face regarding the integrity of the most preeminent investigative organization in the Western Hemisphere? 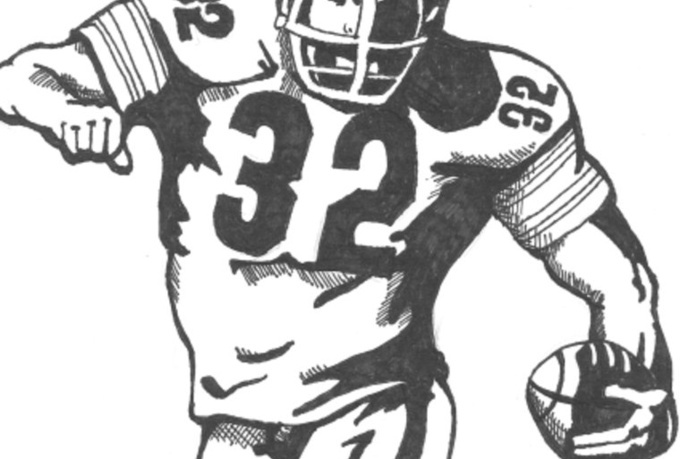 Though unlikely, but possibly unbeknownst to the FBI at the time was that they were about to pay dearly for the disastrous slam to their reputation by the revelation of their involvement in a notable case of corruption 25 years earlier to conceal evidence that resulted in an innocent man spending almost 29 years behind bars. The FBI was the sole creator of the COINTELPRO program that appeared to have no scruples about who it framed, in order to reduce the potential threat to what its originator, the late J. Edgar Hoover, considered to be a threat to the tranquility of the United States of America. 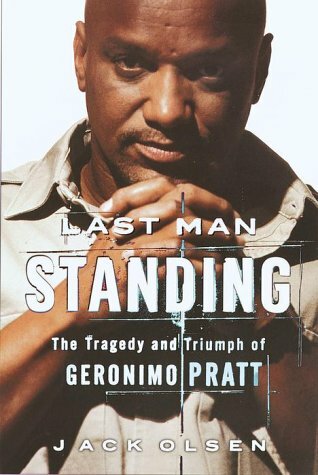 As a result of Hoover’s COINTELPRO via its aggressive and unlawful policies, the Viet Nam wounded war veteran, Elmer “Geronimo” Pratt, would spend the better part of half of his life locked up in California prisons and noted to be the longest political prisoner held in the world after the release of Nelson Mandela. Interestingly, it would be the lawyer Johnnie Cochran who as a younger naive attorney had represented Pratt during his fight against the trumped up charges of murder against him. In the end, upon securing Pratt’s release with a final appeal, Los Angeles County would ultimately pay out $2.0 million dollars and the FBI $1.0 million for unlawfully depriving Pratt of his freedom. Los Angeles County due to Cochran and others, one could argue, were used to these multi-million dollar damage awards as a result of civil trial victories against a plethora of acts of police malfeasance and brutality. However, at the time, it appears this was potentially an unusual position of embarrassment for the FBI to find itself; and in that instance, dating back to 1972, they could not blame the other party, the County of Los Angeles, since COINTELPRO belonged to them. But their reputation was on the line once again, and potentially simultaneous to the year that they would pay dearly for the taint upon their reputation as a result of the Pratt appeal victory in 1997; however, it was also potentially simultaneously occurring adjacent to another disaster regarding potential malfeasance in the Simpson civil trial. Special Agent Bodziak was said to have voluntarily resigned to do other things of professional interest, but naturally curiosity arises to what professional on track to move up in the FBI resigns at such a youthful middle age? However, unknown to many who have failed to go any deeper than their supermarket tabloid into this Simpson matter, it’s in 1994 when Bodziak discovered the unique pattern of the soles in the shoe prints photos in blood at bundy, and testified to them during his 1995 trial testimony. We allege that Bodziak was in no position to tell the world that the shoe prints at Bundy were made exclusively by Bruno Magli. 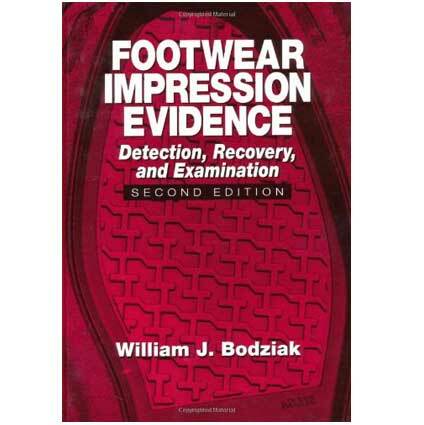 Bodziak would wait 4 more years after the criminal trial in 1999 to publish a re-edited edition of his college textbook FOOTWEAR IMPRESSION EVIDENCE with its new Chapter 15, OJ Simpson Chapter. Within the Simpson chapter Bodziak points out that the shoe sole was not manufactured by Bruno Magli, as he admitted during the criminal trial, but by SILGA GOMMA, a rubber shoe sole manufacturing company. 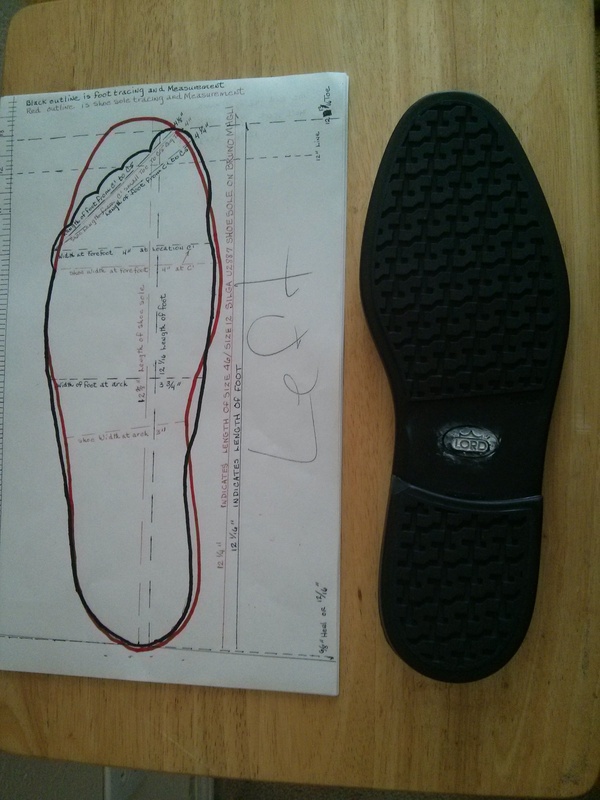 The sole on the bottom of the alleged shoe that they claim Simpson wore, the Bruno Magli Lorenzo model, came from SILGA’s U2887 size 12 shoe sole mold as Bodziak alleges. Bodziak states further that SILGA provided the same shoe soles from the same U2887 rubber mold to 20 other shoe brands besides Bruno Magli. If you look at the image of the print in paragraph 7 above, you will see a gap in the middle of the shoe print because the raised heel keeps that middle area elevated and off the ground. 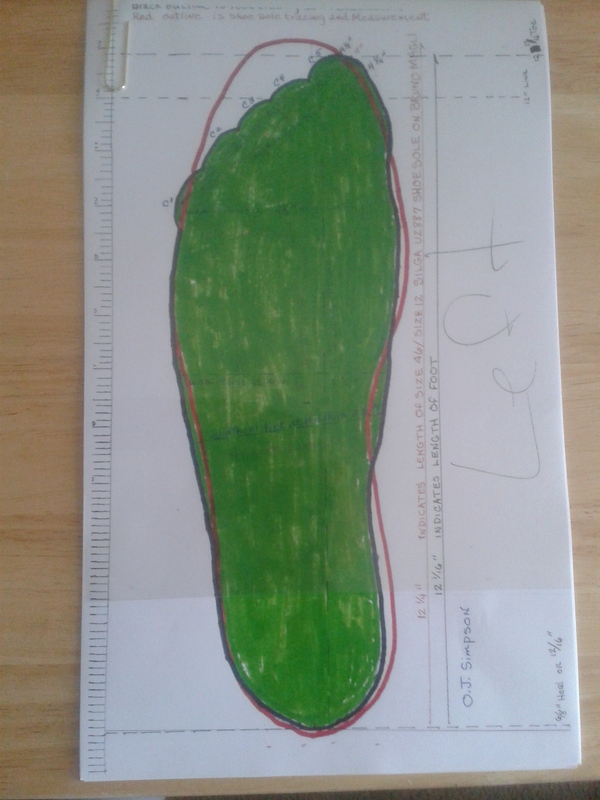 Thus, that clearly elevated area in the middle, between the heel and the forefoot, is where the identity logo (BM) for Bruno Magli is placed. Thus, the question that the public needs to put to any of the news publications that keep reciting Bodziak’s presumably gold plated supposition that those prints were made by one of the 299 pairs of Bruno Magli shoes sole in the US. Ask them how does one know that? What prevents those bloody shoe prints from being made by any one of the 20 other brands of shoes sold on the Asian, European, or South American continents, from arriving in the United States with those U2887 SILGA shoe sole attached to make those bloody shoe prints at 875 South Bundy? The most insidious and equally unprofessional claim as far as we are concerned, that raises further questions about the legitimacy of the photos of Simpson in those shoes in 1997, is Bodziak’s claim that Simpson’s foot fit inside the size 12 Bruno Magli shoes that made the bloody print at Nicole’s residence at 875 South Bundy, in Brentwood, Los Angeles, California. Bodziak admitted under direct examination by a deputy prosecutor, Hank Goldberg, that he did not take the time to measure Simpson’s foot, though Simpson was easy to locate at the Los Angeles County Central Jail. Bodziak went on to state that people generally choose the size of their shoes by preference rather than by precise measurement. 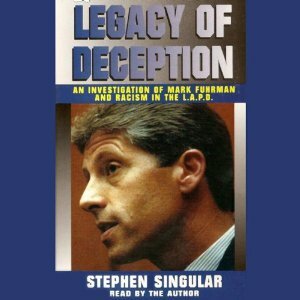 Bodziak’s testimony came after LAPD Detective Tom Lange admitted under cross examination on February 22, 1995, that he did not follow protocol and deposit the alleged Simpson Reebok tennis shoes he attained from Simpson at his Rockingham address with the LAPD police property unit as the rules of section 510 of the police procedural handbook require. These were the Reebok tennis shoes used to compare for size with the Bruno Magli’s that Bodziak had attained. 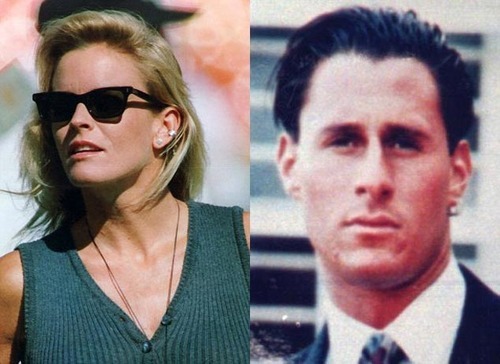 Lange admitted that he carried the alleged Simpson tennis shoes back to his personal residence 50 miles outside of Los Angeles to Simi Valley, (now infamous in its own right for the acquittal of police officers in the Rodney King beating that instigated the L.A. riots of 1992). In fact, Detective Lange would further admit that he did not deposit those Reebok tennis shoes at all. The official chain of custody of this evidence was broken by Detective Lange when he allegedly turned them over to an employee of the LAPD, Greg Matheson, on June 14, 1994. Matheson in his role as an employee, criminalist, of the LAPD was not a sworn officer of the court, regardless of what Lange alleges was his reason for giving them to him. The date they were turned in to the police property unit and the exhibit file number for the alleged Simpson Reebok tennis shoes is uncertain, according to testimony given by Detective Lange. LEGACY OF DECEPTION, Joseph Bosco’s A PROBLEM OF EVIDENCE and T.H. 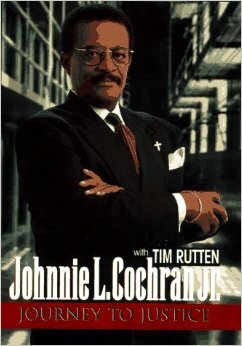 Johnson’s PURSUIT OF EXHIBIT 35 IN THE OJ SIMPSON MURDER TRIAL because unlike Fuhrman’s book, Dets. Lange and Vannatter’s book, Darden’s book, Clark’s, and Bugiliosi’s, the former books get down into the trenches to bring you the nitty gritty facts, where as the latter do not, and if challenged you would find they were ghost written fluff. Awesome article. Was wanting an explanation about this forever! 🙂 You’re my hero.